When you travel often you pick up tricks to make travel easier and more manageable. For me, one of those tricks are packing cubes. They are essential to help keep me organized. After trying a variety of options, I found compression cubes are by far the best value. This review will cover value, price, and durability. Each set includes one medium and one large sized cube. These three brands come in a variety of color in three different price points. Eagle Creek has been a leader in the travel industry for years. It is one of the first places I went to because of their reputation for quality. The Pack-It Specter Compression Cubes come in at the highest price point. You can purchase them through Amazon for around $40. They are ultra-lightweight, water resistant and slightly translucent. They come in four colors, Brillant Blue, Flame Orange, White/Strobe, and Ebony. Now for the review. I really like these cubes. They add no extra weight to your bags and have a terrific compression system. Extremely durable, I have never felt like I overstuffed them so that the seems would break. Unfortunately, the cubes are not as translucent as I would like and they only have a partial opening. The zipper can snag quite easily if you’re not careful. However, overall, it’s a great system. Lewis N. Clark is a mid-priced travel company, a tier below Eagle Creek. Their prices reflect their position as well. You can purchase the Elctrolight Compression Cubes on Amazon for anywhere from $22 – $44. They are ultra-lightweight and have a highly visible front mess panel, which makes it easy to find things. They come in four colors, Neon Lemon, Bright Blue, Charcoal, and Red. I started out with these cubes because of their price point. I purchased the lowest priced ones, which coincidentally was the brightest colored. These cubes work well. They have a great clamshell design. Where they fall short is the construction. They don’t feel particularly solid and the pull tabs fell apart quite quickly. Also, the zipper tends to snag so you have to run your finger underneath the zipper in order to prevent snags. Tripped Travel Gear is a new company. The couple who owns the company took a year off to travel the world. They used the Eagle Creek Compression Cubes on their travels. 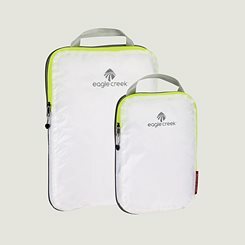 When they came home they developed a set of packing cubes to fill the holes they felt were in the Eagle Creek compression cube. You can purchase these cubes on Amazon for $22 (however at this posting they are currently out of stock). They tend to be a little heavier than their competition, however, it’s not heavy enough that it makes a huge difference. These cubes come in only one color, White. I recently purchased these cubes and have fallen in love. They are made from a water-resistant rip-stop fabric, which makes them feel very durable. The zippers are reinforced and snag free. They are almost the perfect cube. The only thing I would’ve done differently is to change the opening to a clamshell opening. For my money, the best option is the Tripped Travel Gear Cubes. They are a great durable andsnag-free free zipper is essential when you’re looking for something quickly. Have you reviewed any of these products? Is there a different set of pack cubes you would recommend? Let me know.